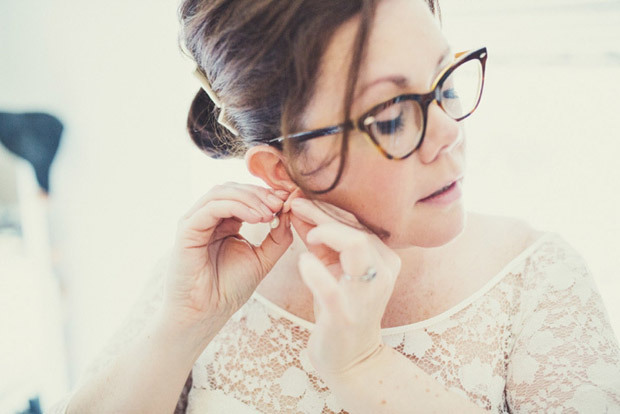 We know this to be true – most women who wear glasses on a daily basis probably won’t want to wear them on their wedding day. But sometimes, it’s inevitable… and sometimes the glasses are such a part of the lucky lady’s personality, it’s hard to imagine her without. 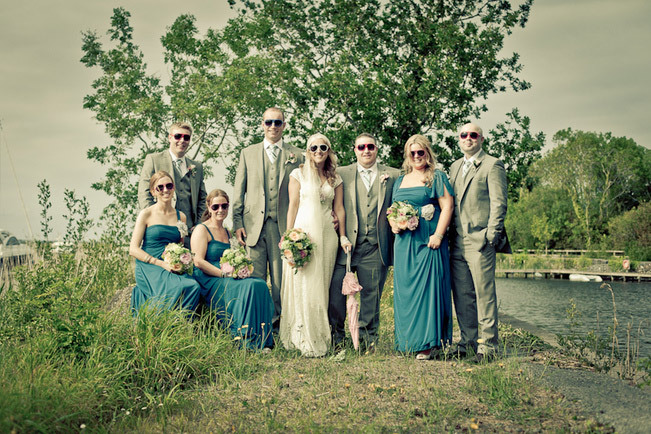 In a word, a bride in glasses is one cool cat. Here are some tips on how to get the most out of the look. The only people who don’t understand the appeal of glasses are, well… kids. But today a stylish set of frames can make your perfect-vision friends and colleagues sigh with envy. 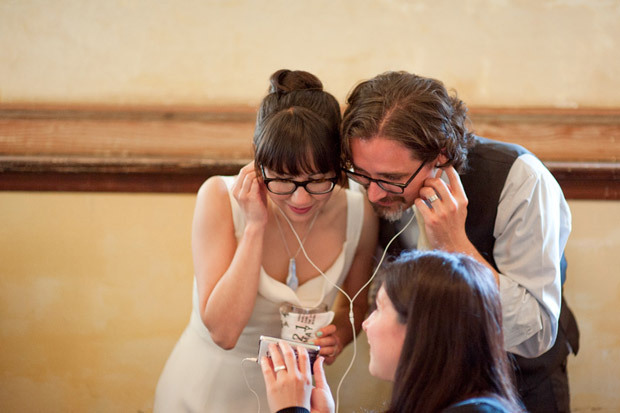 So make your glasses a real feature on your wedding day. Treat yourself to a brand new frame to perfectly complement your dress, or grab a real statement piece for a splash of colour. 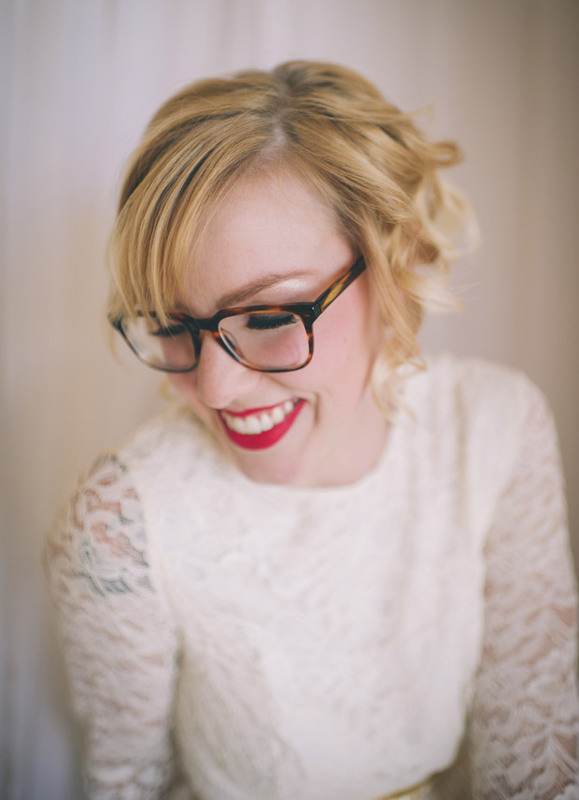 Or, how about white frames to go with the dress? If you’re shopping for new glasses, be sure to ask about anti-reflective options – they’ll be best not only for daily use, but also for your photos. They eliminate the reflective glare you see (at night, for example), as well as the reflections others see when they’re looking at you. Some frames have sharp corners, rhinestones or decorations that could catch your veil and pull or snag it. 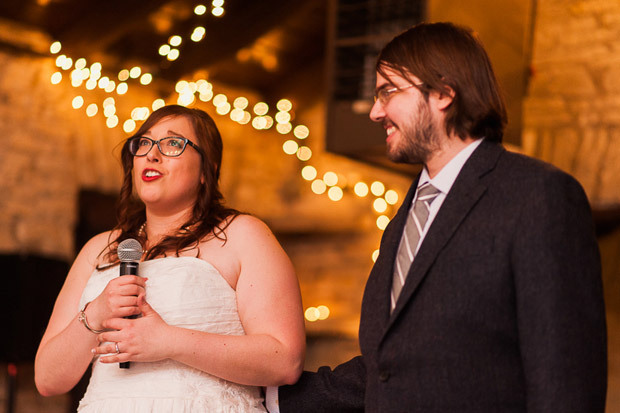 Make sure to try on your veil and glasses together to test for any potential mishaps. Even better, fashion a play veil out of some tulle and try with that. Your real veil will thank you. There should be no danger of getting anything caught in your glasses. 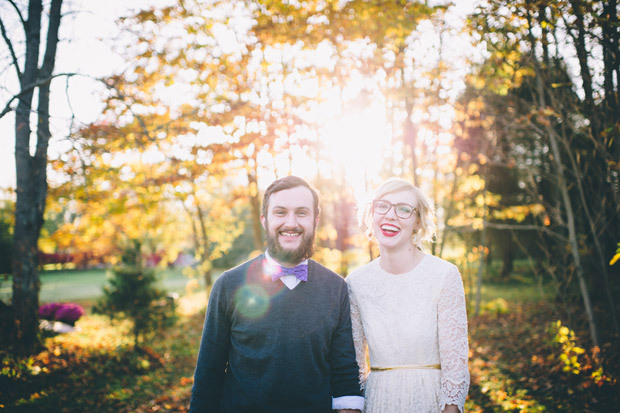 If you’re having a vintage-style wedding, check out styles of glasses worn in that era. 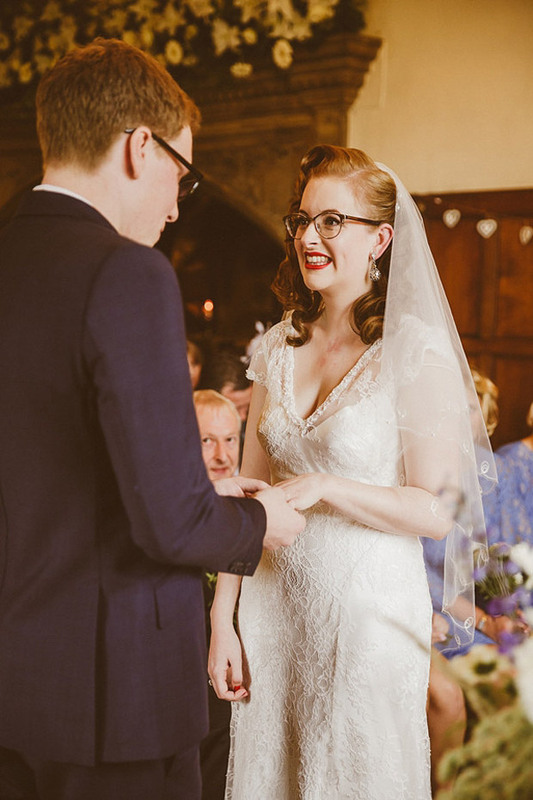 Say you’re having a 50s tea-length dress – those cat eye styles will look absolutely fab. Just look up some pics of Marilyn Monroe in the movie How To Marry a Millionaire – she wears hers with a smashing white pencil gown and fur stole. The 1930s and 40s tended more towards round looks, while the 1960s moved into more exaggerated cat eye styles and towards the huge statement pieces they became in the 1970s. Have fun looking them all up – you’ll find your faves in no time. It used to be non-negotiable – earrings and glasses don’t go together. We say – do what you love, darling! But if you are going to make your glasses a strong statement, it’s best to let them take the star spot where embellishments are concerned. 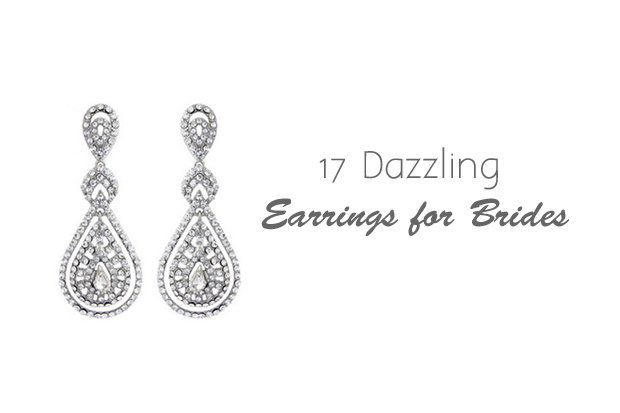 A gorgeous look is a combination of classic stud earrings with something interesting in your hair, plus glasses. Play around with it, have a friend take photos from all angles and see which style you love the best. This one’s for the girls who will wear contacts – always keep your glasses handy. On the day itself you may cry, you may get something in your eye, or you could simply develop a reaction due to high nerves. Red, puffy eyes aren’t a good look on anyone, so make sure to bring your glasses as backup. Just to fun things up a little, you know? You’ll look gorgeous with or without them (thanks to your fab makeup) and you’ll have some lovely variety in your photos. If your other half wears glasses too, you could both take them off for a pic or five. Tell your makeup artist and hair stylist you’ll be wearing glasses and make sure to bring them to the trial – if not the exact pair, then something close enough. You’ll work out the best look together – you don’t have to compromise on the dazzle factor just because you’re wearing glasses. It’s true your eyes are partially hidden – so let your complexion make a statement instead! It’s all about the base, ladies – don’t be afraid to use a great foundation, contouring, powder, highlights for a fabulously flawless skin that’s smooth and dewy. Be sure to highlight those cheekbones and under the eyes, as glasses may create shadows. If your glasses make your eyes appear bigger, try using a small amount of eye-liner on your top lid and avoid lining the bottom lid. This will make your eyes seem smaller and more natural. On the other hand, if your eyes look smaller behind the glasses, line both lids to bring extra attention to the eyes. Eyeshadow depends on the frames you’ve chosen – it can sometimes get lost behind the frames, or the opposite… like too much of a good thing. The answer for most is – go neutral! Natural eyeshadows look fabulous with thin and thick eyeliner. And for a subtle pop of colour, add a shimmer to the bottom lash line to draw more attention to the eyes. Eyeliner is a definite yes – as already mentioned – but how to wear it? Let the frames be your guide – you can’t go wrong with thin eyeliner for thin frames, and thick eyeliner for thick ones. As a final touch to the eyes, don’t be shy with the mascara – full, thick, flirty lashes will look fantastic behind those glasses. Eyebrows have people sitting on the fence – some ask if there’s any point having them pampered and shaped if they’re mostly hidden? It’s always, always a good idea to keep your brows looking their best – after all, they frame your face. Make sure they’re trimmed and lovely, and you can even go as far as matching the shape of your glasses’ frame. And finally, one of the best things about glasses is balancing them out with gorgeous bright and bold lips. You can’t go wrong really – use bright pinks, fiery reds, daring purples and fabulous oranges – whatever strikes your fancy. It’s truly a top look for ladies wearing glasses!